Hello my name is Roy G. Barnhart. I am a Pasco County Native and Second Generation Realtor. 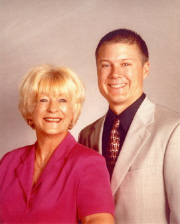 I have been Servicing Pasco County’s Real Estate needs since 1997 and My Partner/Mother has been a Top Producer in the Pasco market since 1979. In 2002 Gail and I formed the Barnhart & McKay Team and have had much success. We are Consistently in the top 5% of all the Realtors in our area. We attribute our successes to Dedication, Hard Work, Spending Money on Key Marketing, and Our Center of Influence of Family and Friends. We take pride knowing our area better than most and we Love were we live and work. We can help your family with all their Real Estate needs. Let Our Family Help Yours. I look forward to hearing from you. Thank you for visiting my page. We offer Top Notch full Service Marketing at Competitive Rates. In this ever Changing Market home sellers need all the Ammunition they can get to get their home sold. So, Why not Hire the Big Guns!! Gail and Roy have over 39 years of combine Real Estate Marketing Experience and Knowledge that gets homes SOLD!! Why Not Join our list of thousands of satisfied family’s and Get on our Sold List. Call today for your No Obligation, No Pressure, and Free Consultation. Wheather it be your first home purchase or you’re last there are many variables that can affect the out come of purchasing a home. Gail and I work hard to make sure the transaction runs as smooth as possible and iron out any of the unforeseen pitfalls that could derail your closing. Experience is our key to making your Real Estate Experience pleasurable. This page has been visited 6,584 times.